Now that it's springtime, our thoughts turn to hops. That's right, it's time for our annual Hopped festival. 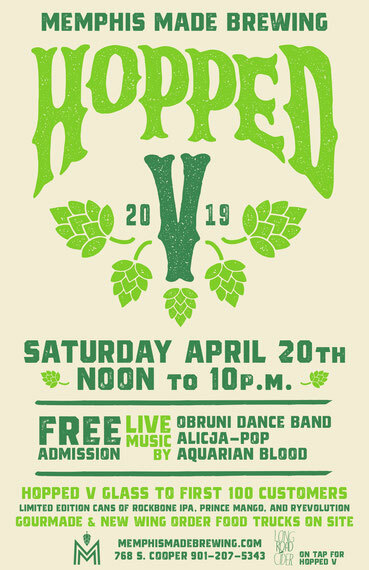 This year, Hopped V is noon to 10 p.m. on Saturday, April 20. We'll have limited edition cans of Cat Nap, RockBone, Prince Mango, and Ryevolution. We're bringing back Plum Stupid as well as cask offerings of various hoppy beers. Long Road Cider will also be on tap for that day only. We're also giving away Hopped glasses to the first 100 customers. Obruni Dance Band, Alicja-Pop, and Aquarian Blood will be performing live in the parking lot. Gourmade and New Wing Order will be on site to feed everyone. We'll have some Hopped and new beer shirts available that day, some of which you won't want to miss. This is our fifth year doing Hopped and we've always had a good day of music, food, and hoppy beers. We're also going to have a ramp up to Hopped called A Taste of Hopped, featuring 4-packs of RockBone, Prince Mango, Ryevolution, and Cat Nap. We'll be at Cordelia's Market 5-8 p.m., Wednesday, April 17, followed by Joe's Wines & Liquor 4-7 p.m., Thursday, April 18. On Friday, April 19, we'll be in two spots from 5 p.m. to 7 p.m.: Buster's Liquors and Wines and Corks Wine & Spirits. Come join as we celebrate all things hoppy in the beer world this week.